As a mum, one of the golden rules you’ll adopt in the very early days of parenthood is to never, ever be without baby wipes. At all times, there should be a pack in the car, your nappy bag, the nursery, the kitchen, the bathroom – you get the drift. Something so vital to the harmony of any household needs to be free of nasties – so your best bet is to seek out wipes that are gentle on bub, and the environment. These wondrous wipes from Naty are renewable and made of 100 per cent natural material – we’ve given them a green thumbs up! If there’s one place that chemicals don’t belong, it’s in baby wipes. They’re being used on a baby’s most sensitive areas, so they need to be as natural as possible. As a bonus, the more natural they are the less their impact on the environment- it’s a win-win. 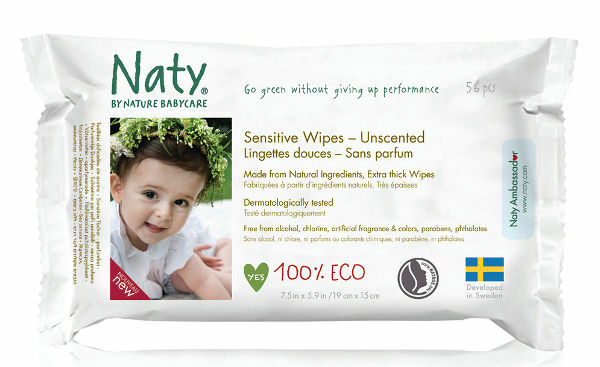 Naty Eco Sensitive Wipes leave a very small environmental footprint, while maintaining peak baby-cleaning performance. They are soft and thick, so even the messiest of nappy changes are controlled, in supreme comfort. Naty worked for years to develop its signature biodegradable Baby Eco Wipes. But the company has continued to research and fine tune its product, with the Naty Eco Sensitive Wipes now even further improved. There’s a new formula, to go with the even softer and thicker wipes. The wipes are compostable, and they are made using ingredients from plants – so no nasty synthetics. They’re also free of chlorine, perfume, alcohol, artificial fragrance, colours, parabens and phthalates. What they do have is chamomile extract, which helps to soothe and keep nappy rash at bay. If you’re keen to give Naty Eco Sensitive Wipes a go, you’ll save $1 off a pack of 56 wipes at selected Coles stores and Coles online from today, September 9, until September 22, 2015.